August 2nd, 2018: Media reports today quote Whitehall sources claiming that taxation of vaping products is being considered for the autumn Budget. My recent blogging attempts have been rather curtailed for a variety of reasons, shoddy internet availability,far more gifted peers,the lack of anything much to contribute. This blog will follow a typical pattern of a scattergun approach, and trust that someone, somewhere, may find it interesting or at least a discussion starting point. I wonder if there is now a new ‘moral panic’ about fake news. UK MP’s among others seem to think that fake news is undermining democracy. I’m not sure I’dgo that far (yet). I get most of my news from the BBC (including the excellent World Service) and I’m reasonably confident that the BBC can tell real news from fake news. What they decide to report on is another matter, but I do trust this news source and they are careful to say when some news story (usually reports of an atrocity somewhere in the world) cannot be independently verified. However, if you get your news from Willy Wonka’s News Blog or the social media equivalent of ‘my mates in the park’, then that may well be a different matter. If we are interested in being honest about these things, even committed vapers — aficionados of “electronic” cigarettes — will acknowledge it’s not as good as the real thing. Just as the old, now sadly prohibited, advertisements promised that “You’re Never Alone With A Strand” so nothing can quite replace the pure, wild, goodness of cigarettes. Brexit und dennoch Sündersteuer auf E-Dampfprodukte in Großbritannien? 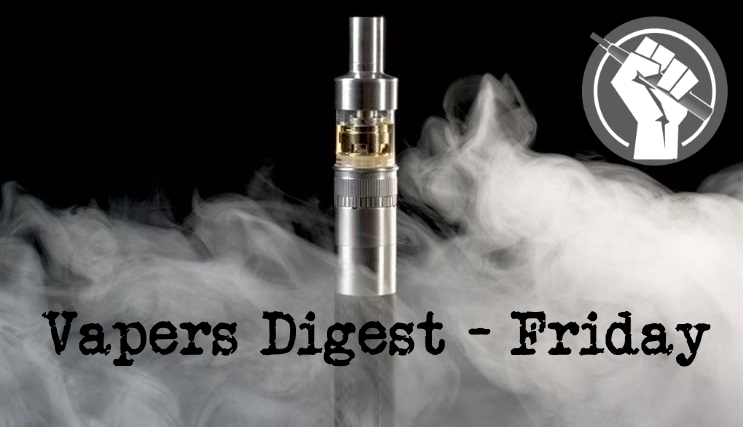 CDC and other U.S. government agencies rarely publish straightforward numbers and conclusions about adult e-cigarette use; their focus is usually on underage use. Last month, by re-analyzing the federal data, I demonstrated that the number of American vapers declined in 2017 (here); following are additional insights. Many years ago, I was scandalized when a prominent green campaigner joined a giant mining multinational to be its “sustainability champion.” How can a committed environmentalist work for a company that devastates the environment and destroys communities wherever it operates? “That’s the point,” he retorted bluntly. “You have to go to where the dirt is if you want to clean it up.” He was right, I was wrong, and I admire him to this day for making that move and for what he achieved in the role. While the number of smokers in the US who are switching from smoking to vaping has declined over the last three years, this PATH study has indicated that e-cigarettes are still the most popular cessation tools. To conduct their research, Tarik Benmarhnia and colleagues looked at data from Waves 1 and 2 of the FDA-funded PATH Study to evaluate “the influence of [e-cigarettes] and pharmaceutical cessation aids [varenicline, bupropion and nicotinemedicines, NRT] on persistent abstinence (≥30 days) from cigarettes, and reduced cigarette consumption” between 2013 to 2015. Arrests continue to be made in Singapore as nationals try to vape instead of smoke and visitors to the country are stopped at airports. The government relies on debunked dogma to support its position, while cigarettes remain on sale and legal to smoke. The advice for all travellers is to leave your vape kit at home. Earlier this month, Safe Travels magazine issued advice for people planning on travelling to Singapore: Being caught drunk in public could land you up to 15yrs in prison, talking about politics in public requires approval from the Ministry of Manpower, and vaping is utterly banned. In what’s rapidly turning out to be the JUUL news section this week, latest updates reaching POTV Towers is that the company has finally ended its passive stance. After a continual onslaught of lies, slurs, and then a lawsuit – JUUL bosses have responded through a legal team to demand that a frivolous class action lawsuit be dismissed out of hand. A recent report from the Royal Australasian College of Physicians (RACP) acknowledging that personal vaporisers (e-cigarettes) can help smokers quit is a welcome change. (1) Nevertheless, the College still continues to oppose their use because of concerns about potential risks. This summer marks nine years since the Family Smoking Prevention and Tobacco Control Act (TCA) was signed into law, and one year since we announced the FDA’s Comprehensive Plan for Tobacco and Nicotine Regulation. This comprehensive plan places nicotine, and the issue of addiction, at the center of the agency’s tobacco regulation efforts. The multi-year roadmap provides a framework for regulating nicotine and tobacco and is designed to reframe the conversation around nicotine and harm reduction. The safety notice was issued after “a small number of consumers” reported having problems with their Vype eTank Pro devices and brought it to the manufacturer’s attention. These issues relate to the potential for the battery on the e-cigarettes to short circuit, which may pose a fire risk. The Vype eTank pro starter kit was previously available to buy online and in Sainsbury’s stores for £25. The draft law, in particular, proposed to prohibit the sale of electronic cigarettes and their liquids to minors. The vaping market in South Africa is expanding at a steady pace, although these devices are not yet affordable enough to gain real traction. A new study by the global management consulting firm Canback says the South African vaping market grew by an average of 10% a year over the past decade. BAHRAIN’s vaping community is up in arms after the government slapped a 100 per cent tax on e-cigarette liquids. Authorities have extended a sin tax on tobacco, fizzy drinks and energy drinks to include e-cigarette liquid, doubling the price of all new vape juice imports. The product was slapped with excise tax on July 12 without any formal announcement, after being classified as “tobacco”. New Zealand led the world in the fight against smoking-related illnesses with its Smoke-Free Environments Act 1990. Almost three decades and several amendments later, New Zealand is on the threshold of passing another revolutionary piece of public health legislation. Yesterday the Associate Minister of Health, Nicky Wagner, announced a further step in legislative change that will see nicotine for use in vaping products legalised for import, marketing and sale by the end of 2018. On the face of it, the decision that the Food and Drug Administration announced on Friday, extending by four years a crucial deadline for e-cigarette manufacturers to seek approval of their products, was no more than a stay of execution. But the FDA also signaled a new receptiveness to vaping as a harm-reducing alternative to smoking, which suggests this reprieve could turn into a commutation.